Police are appealing for the public to check on their elderly and vulnerable neighbours after two incidents in the early hours of this morning. The first incident - at around 9.30pm last night - a man was disturbed in a property in Messines Park in Londonderry where an elderly lone female was in bed. 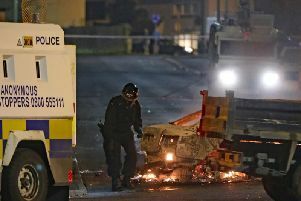 A PSNI spokesman said the victim was" obviously shaken and upset" but "thankfully she was uninjured and nothing taken". A PSNI spokesman on PSNI Foyle Facebook said: "We are treating these incidents as linked and Detectives would appeal for for any witnesses to come forward by ringing 101, alternatively info can be provided to the independent charity, Crimestoppers, on 0800 555 111, which is 100% anonymous and gives you the power to speak up and stop crime. "I would appeal to anyone with Elderly or vulnerable neighbours to check on them and ensure all windows and doors are locked and we can all try to keep everyone safe."